what would you like me to provide to tell me which those devices are ? What hardware did you add or remove preceding these Device Manager bangs appearing? What software did you add or remove preceding these Device Manager bangs appearing? All browser toolbars are unnecessary and usually load crudware. Check your Add or Remove Programs for other stuff it may have loaded. Go to Start > Control Panel > Add or Remove Programs > Hotspot Shield Toolbar > Remove/Uninstall. Click “Yes” to confirm the uninstallation. If you are using Mozilla Firefox, go to Tools > Add-Ons > Extensions > Hotspot Shield Toolbar > Uninstall. Restart your Web browser. Once done, delete one of those from the DM, then click the "Scan for hardware changes" icon and see if it comes back. Looks like the HSSVPN removal is incomplete. It leaves all kinds of stuff in the registry. any idea how to remove them ? are they affecting in any way my computer if i leave it like that ? We do not get into hacking the registry. The link I provided as some instructions on it. yeah since i m completely noob to this kind , could you please answer me if it affects my computer or not just by leaving it be like that ? I would start by simply removing them from the device manager. Restart, and see if they return. If they do, install the free CCleaner. 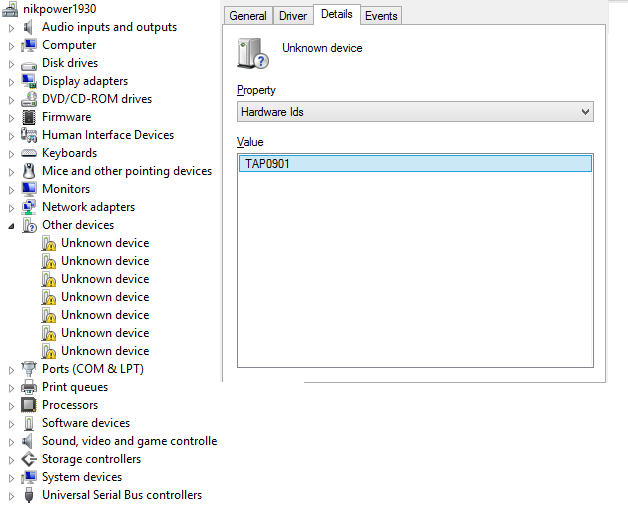 Once back into windows, open the Device Manager and see if those Unknowns are still there. I am missing drivers for ROOT\NET\0001 and ACPI\KIOX0095\1 ( I see them under unknown devices in device manager. I tried installing Kionix Free Fall Sensor Driver from dells website manually but it gives an error.